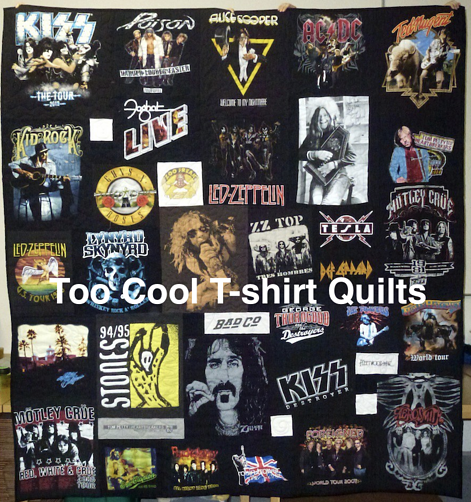 We love making T-shirt quilts from concert T-shirts. 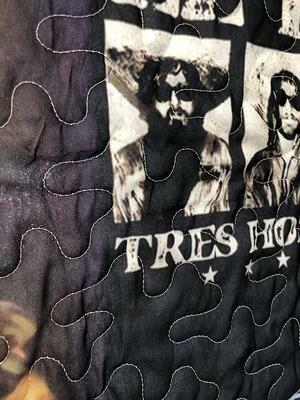 What distinguishes a concert T-shirts quilts from other T-shirt quilts? It is the designs on the T-shirts, the colors of the T-shirts and the value of the quilt. The design sizes on concert T-shirts are huge compared with typical T-shirts. The sizes are 25% to 50% larger. What does this mean for you? When you are planning your quilt, you will need fewer T-shirts than the pricing page indicates. If you are not sure, cut the number of T-shirts you plan for the quilt in half. If a quilt size calls for 20 T-shirts – send just 10. If you have other T-shirts that you would like to put into the quilt if there is room, put those T-shirts in a separate bag. Label that bag “extras – use if needed”. We will cut the first set of T-shirts and then calculate the quilt size. If we need additional T-shirts to make your quilt the size you want, we will work from the second bag. We will stop cutting from the extra’s bag when we get to the size you want. Concert T-shirts usually have a front and back design. And generally, they are both large designs! As you know, the front of most concert T-shirts includes the band’s name and an image. The back of concert T-shirts generally have a list of cities and the dates the band toured there. What does this mean for you? You need to think carefully if you want both the front and back of the T-shirt included in your quilt. You will be able to include more T-shirts if you eliminate the backs. There may be some T-shirts that you just want the front and others that you would like the front and the back. We do make double-sided T-shirt quilts. We can put the front of the T-shirt on the front of the quilt. And put the back of the T-shirt on the back of the quilt. Cool! But there are a couple of considerations. First, the front and back of the T-shirt would not be back to back on the quilt. The chances of the front and back of every T-shirt in your stack being the exact same size is slim. And they would all have to be the same size to match front and backs on the quilt. Second, we would layout each side of the quilt so it looks great on its own. We take a number of design elements into consideration when we lay out your quilt. The design elements we use from the T-shirts probably will be different on the front than on the back. These elements are important to us when we lay out the quilt. Third, it’s probably not all that important that the fronts and backs correspond on the quilt. We think it’s important to have to search to find each block. While you are searching for one block, you will stumble across a number of other blocks. Since a block = a memory, you will see other awesome memories as you look. Last, double-sided T-shirt quilts are expensive. They are not as expensive as two quilts, but close. Read more about double-sided T-shirt quilt here. 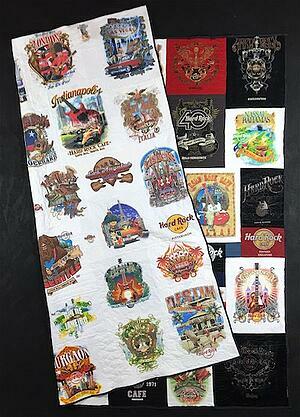 For these reasons, many customers choose to include only the fronts of their T-shirts in their quilt. 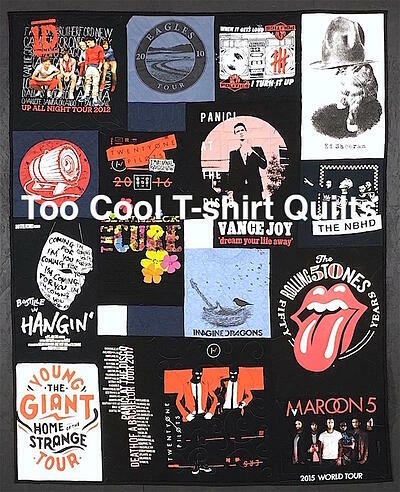 Download our Concert T-shirt Quilt Buying Guide for more helpful information on planning your quilt. Most concert T-shirts are black. When all your T-shirts are black, the black becomes the background. A backdrop for the designs on the T-shirt. It is like white paper with black writing on it. The paper is the background and the black writing is all you see. The black background allows the images, text and graphics that standout. If all your T-shirts are black, you will have a great looking quilt! If you have a few T-shirts that aren’t black, you will need to make some decisions. Look at the stack of your T-shirts. Is there a mix of blacks, grays, whites and colored shirts? If so, is there a balance between the blacks and the non-black T-shirts? If so, you will be in good shape. But if all your T-shirts are black, except one or two of them, you need to consider if you want to use them. If there are only one or two spots of white or gray or color in your quilt, they will stick out. Your eye will be drawn to the white blocks and the black ones will get lost. If you are unsure if you have enough non-black T-shirts to balance the black, let us know when you send your T-shirts. We can take a look at the T-shirts before we begin cutting them and determine if you have enough to balance out the black T-shirts. 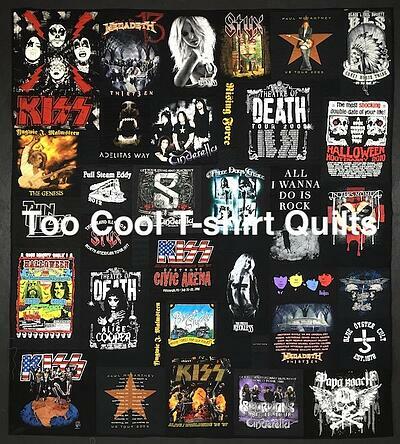 Read more about all black T-shirt quilts here. T-shirts are a strange product. 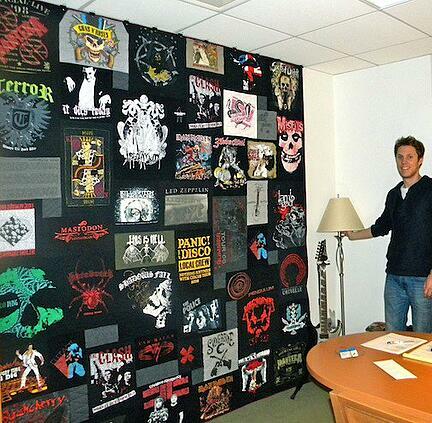 A quilt made from your T-shirt tells a unique story. And most of the time, no one has much interest in your quilt. Stealing it just doesn’t make economic sense. There is not much of a retail value. But the value to you is everything. But, a more generic or single themed a quilt is different. A concert T-shirt quilt is a perfect example of this. 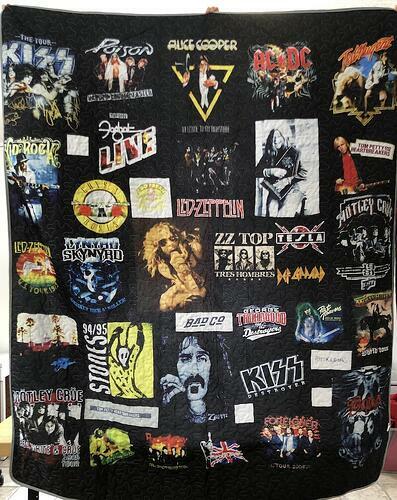 My Rolling Stone T-shirt quilt has value beyond what it means to me. If stolen, it can be resold for more than $50. Concert T-shirt quilts have been stolen right from this website. A slimy group of people are stealing images of cool generic themed quilts from websites. They are reproducing them onto blankets and quilts. Then they sell them on pop-up websites for $69.99. Here’s a photo of a quilt we made and a photo of a blanket made from the image of this quilt. What they are selling is first ripping me off. It also is ripping my customer off who had us make the original quilt. The people who purchase the blanket from the slime-buckets selling them also feel ripped off. They expected a T-shirt quilt and it’s not what they got. Well for $69.99, their expectations should have been very low to begin with. 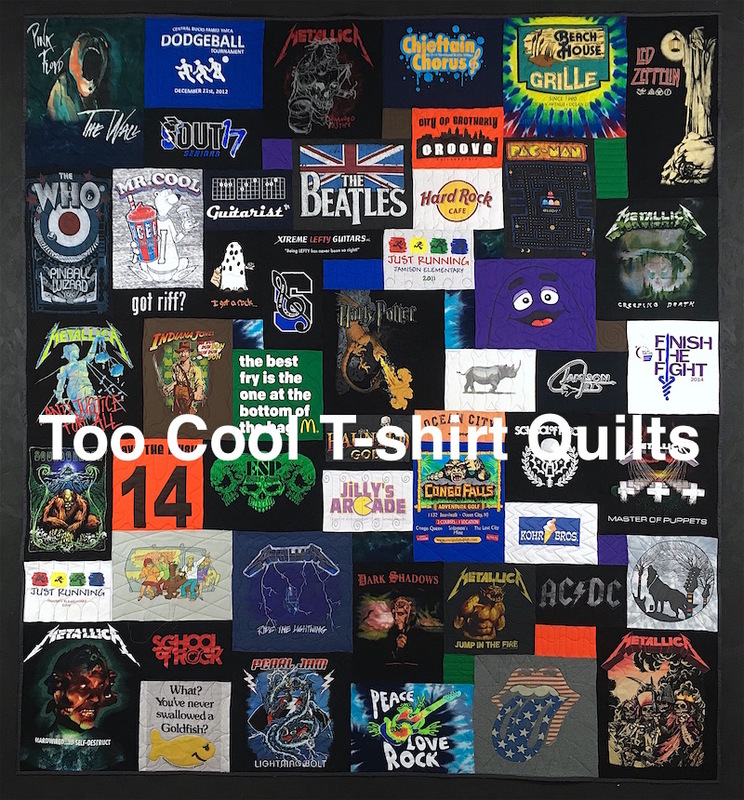 The first quilt with the watermark is the original Too Cool T-shirt Quilt that we made for one of our customers. 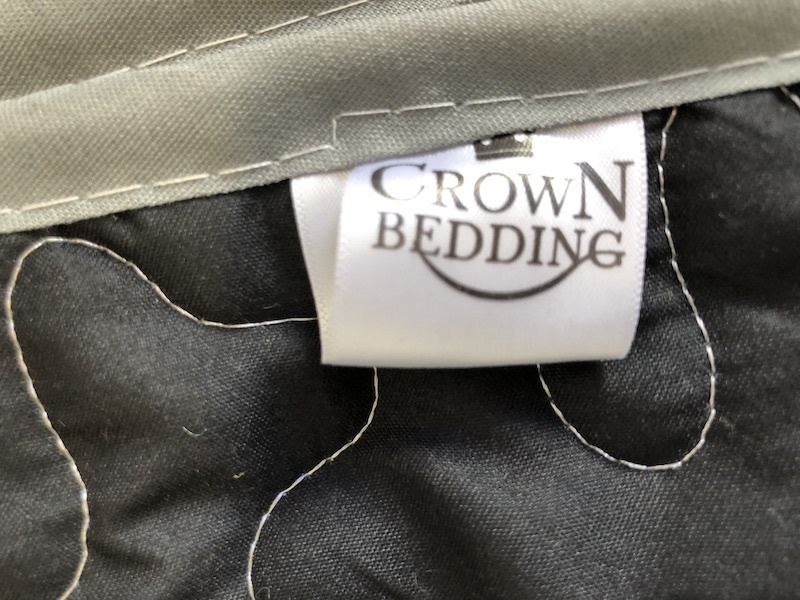 The second thing is the"quilt" that a company called Crown Bedding made. They took the photo from my website and blew it up. It was printed on cheap polyester. It was quilted and bound. It weighs about 1 pound. It's a piece of crap. They have stolen other images from me to reproduce and make money from. What gets me is that they call and blame me! Some want to know where their quilt is. I ask them when did you send me your T-shirts. And then they get confused. They think we are providing the T-shirts. And we don’t! We make quilts from our customer's T-shirt. Others want to know why we sell such crap. Huh?! So, I get their name and check my records. They aren’t in our system. They haven’t purchased anything from us! Then they tell me what they purchased. And it wasn’t purchased from me. They feel ripped off and I tell them that I was ripped off too. 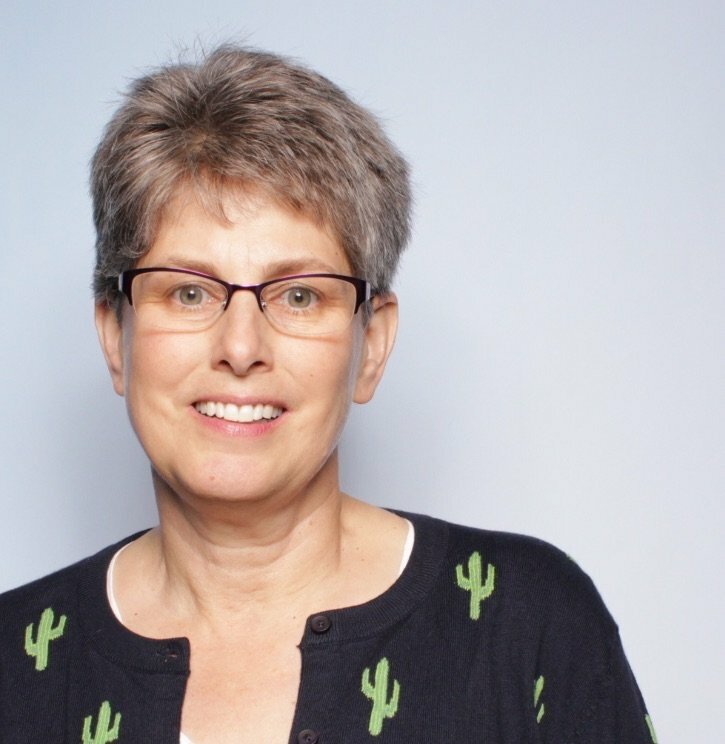 This has forced me to become more careful of the images I put on my website. This wasn’t even something I would have ever thought about before! If there is a quilt that is generic or themed that might get ripped off, I plaster my company name over the image. I hate how it looks. It doesn’t allow you to see the entire quilt. But, it will hopefully keep people from stealing images. Concert T-shirt quilts are awesome. Awesome enough that smarmy people want to steal them!